Your premier destination for authentic thai cuisine in Davis. While you’re here, you can check our diverse menu of curries, salads, and other thai specials. Thai Nakorn is proud to serve delicious Thai dishes that’ll make you think you’re dining halfway across the world. Choose from a bevy of beef, chicken, and vegetarian dishes that won’t let you down. While you dine, why not complement you tasty entree down with some Thai ice tea? Our locally owned and operated Thai restaurant offers all our dishes at competitive prices, so rest assured that you won’t spend a fortune having an amazing dinner. 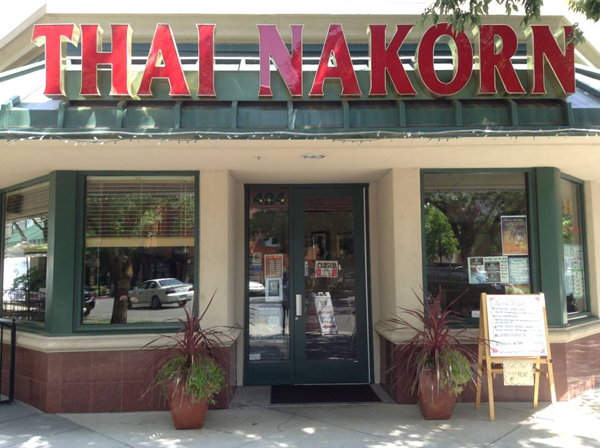 Thai Nakorn, located right next to the Regal Cinemas 5 on G Street, is one of the many Thai restaurants in Davis. Family-owned and -operated, the restaurant is a very popular dinner destination; it is quieter than many of the Thai options in Davis. There are white silverware and glass settings on the tables and the service is usually prompt. The owner is often on hand to wait on her guests and help with questions.